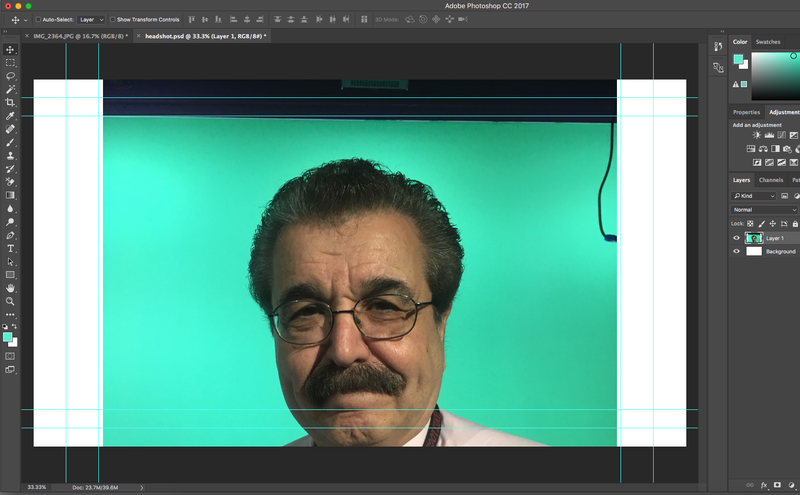 Here are steps you can follow to create an image that features a headshot against a background that illustrates something about the person in the foreground. 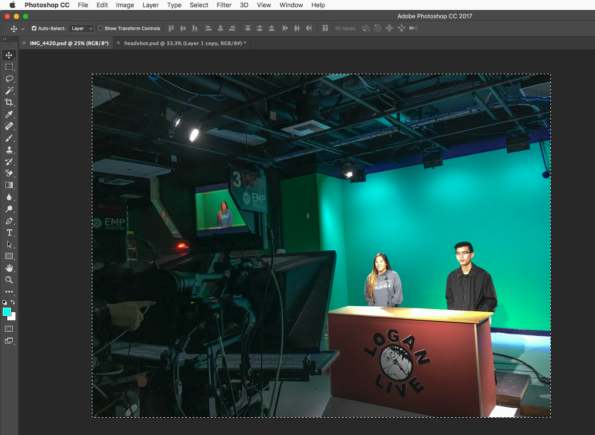 The main tool used is Adobe Photoshop on an iMac computer, but the techniques should be similar for similar applications on any computer platform. In this example, the original headshot was downloaded to an images folder within the associated project folder. In this example, the image uses the .jpg format. Click on the image to select it, then press the [Command+I] keys to open the info window. 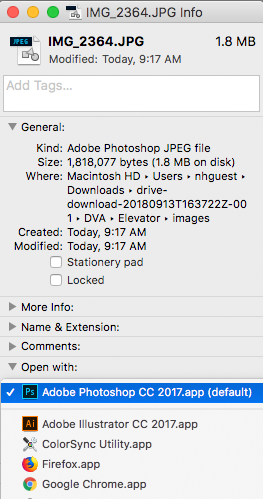 Look at “Open With” and make sure Photoshop is selected. then click on the [Continue] button. When photoshop opens you will see your image. 1. At the top are menus. 2. To the right are information panels. 3. To the left are tools. 4. There is also a tab with the name of the file that is open. Click on the “Window” menu and make sure “Essentials (Default) is selected, then click on “Reset Essentials.” This will make sure your Photoshop layout matches the one used in this tutorial. 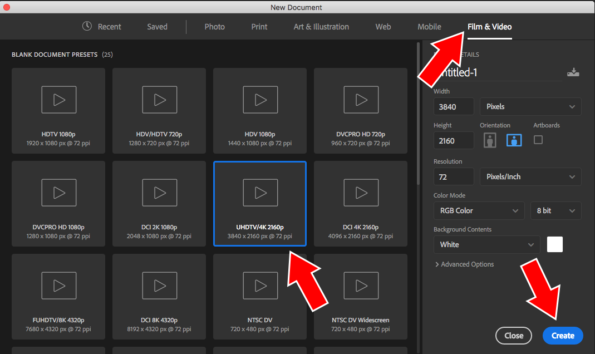 Create a new image by either using the “File” menu and clicking on “New” or using the [Command+N] keys. 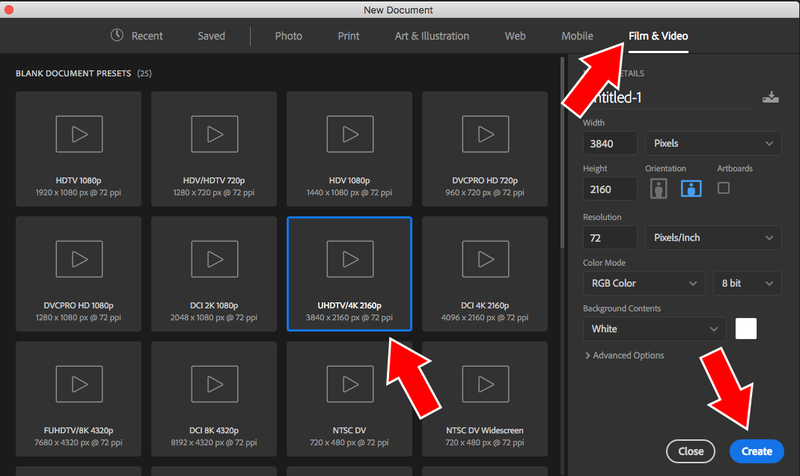 In the “New Document” window choose the “Film & Video” tab, select the “USDTV/4K2160p” format, the click the [Create] button. This size will give you the option of zooming into your image while creating your video project, while keeping sufficient image resolution. 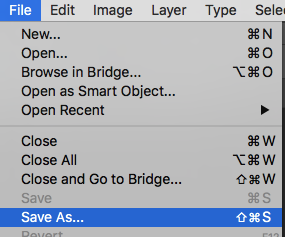 Open the “File” menu and click on the “Save As” option. In the “Save As” field type headshot for the name. Make sure use keep the .psd extension. 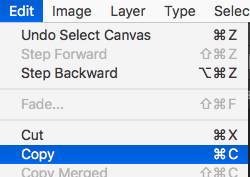 Make sure the Format is Photoshop, then click the [Save] button. When the “Maximize Compatibility” dialog appears, click on the [OK] button. Your new image will have a grid of guidelines that indicate safe areas. The outermost lines are the outside border of the safe action area. The innermost lines are the outside border of the safe title area. 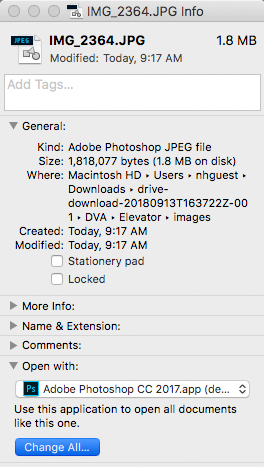 Click on the “File” menu “Save As” option. In the “Save As” field type headshot-NAME substituting your name for NAME. Be sure to keep the .psd extension. 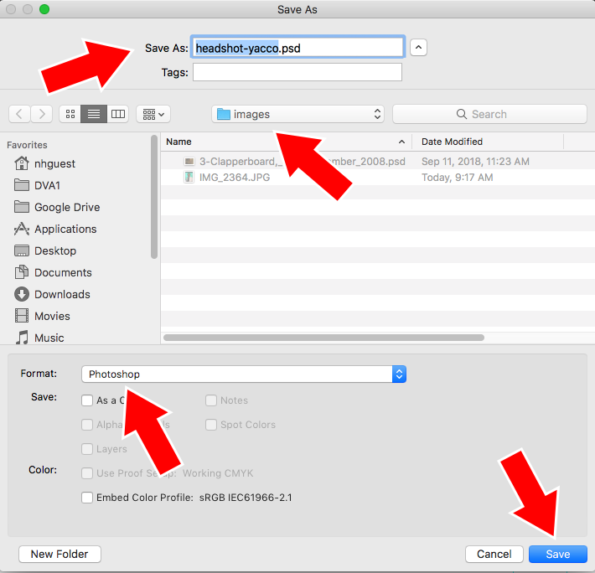 Make sure the Format is Photoshop, and you are saving in your project’s images folder, then click the [Save] button. 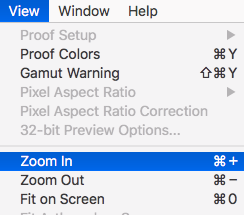 When the “Photoshop Format Options” box appears, click the [OK] button. Look for the tab of your original image and click on it. 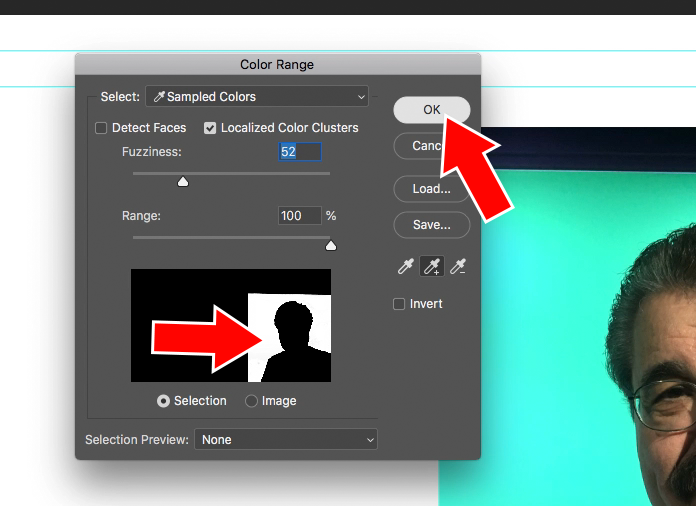 Use the “Select” menu “All” option or press the [Command+A] keys to select all of your image. 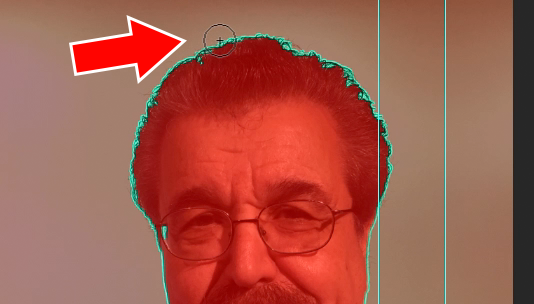 A dashed-line border (often called marching ants) should completing outline your image. 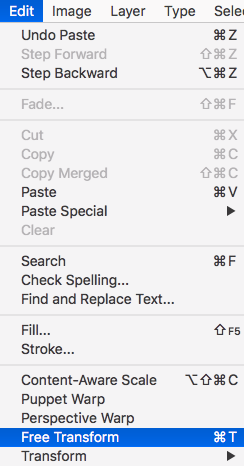 Use the “Edit” menu “Copy” option or press the [Command+C] keys to copy the selection. 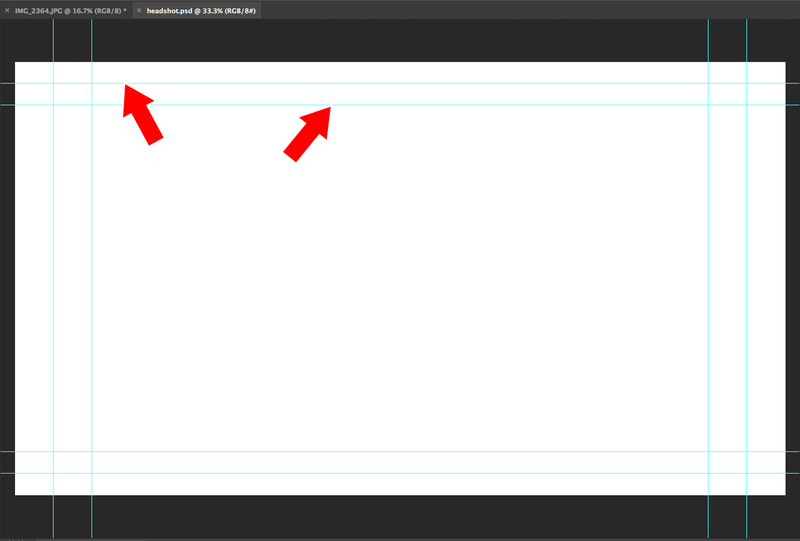 Look for the “headshot.psd” tab and click on it. 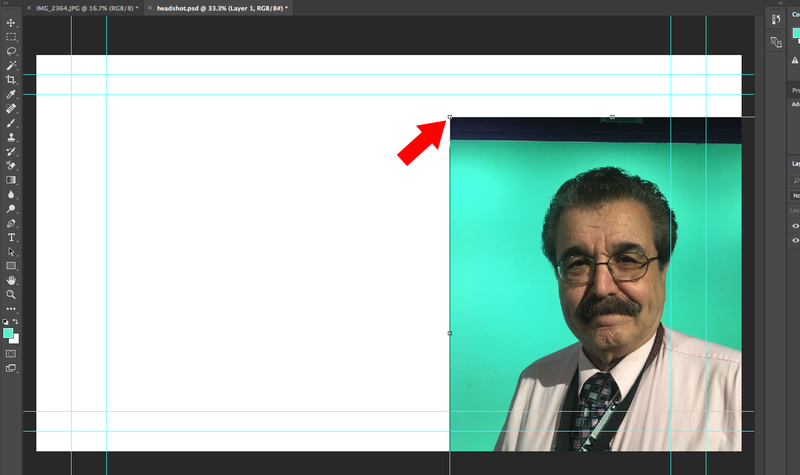 Use the “Edit” menu “Paste” option or press the [Command+V] keys to paste your image into the headshot image. Your image will most likely be larger than the headshot.psd canvas. To resize the image, use the “Edit” menu “Free Transform” option or press the [Command+T] keys. Your image will now have a border with small sqaures, called handles. Click on a corner handle and start dragging it to change the size of your image. To keep the image the original shape, hold the [shift] key as you drag. When the image is the size you want, click in the image to move it. When you are done, press the [return/enter] key. Your image should now be on the lower right-hand corner. The overall headshot image should now have space to the left and above for a background image to appear. If the image you pasted needs correction, do it now. One way is to use the “Image” menu Adjustments/Levels option, or click on the [Command+L] keys. Make sure there is a checkmark next to the “Preview” option. 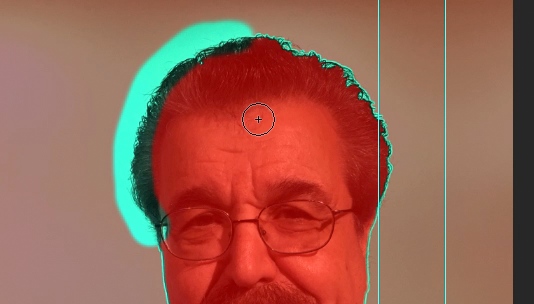 Under “Input Levels” the small, dark grey pyramid on the left will let you make the dark areas of your image darker. The light grey pyramid on the right will let you make the light areas of your image lighter. The grey pyramid in the middle will let you darken or lighten mid-tones. Click the “Preview” option on and off to compare your changes to the original image. If you like your changes, click the [OK] button. If not, click the [Cancel] button. Use the “File” menu “Save” option or press the [Command+S] keys to save your headshot.psd file. As you work, you should save often. 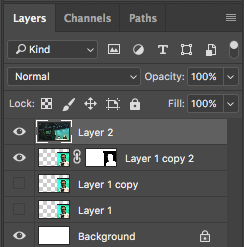 Use the “Layer” menu New/Layer Via Copy option, or click the [Command+J] keys to make a copy of your image layer. Having a duplicate provides insurance in case you make changes that you are unable to recover. 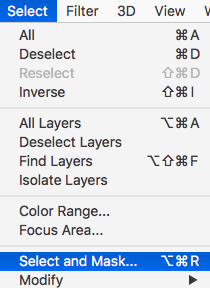 Look at the “Layers” menu at the lower-right of your workspace. 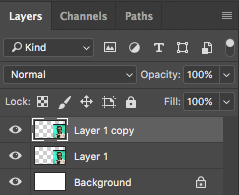 You should now have three layers: The top layer is the copy you just made. The middle layer is the original image you pasted. 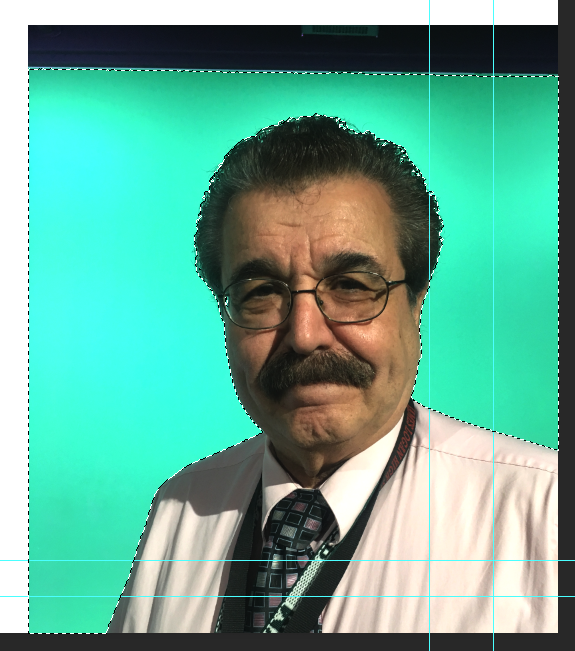 The bottom is the white background that was generated when you created your headshot.psd file. 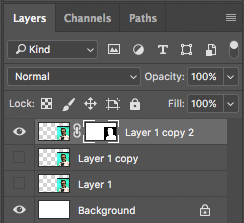 If a layer is on top of another, parts that are opaque will cover all layers below it. 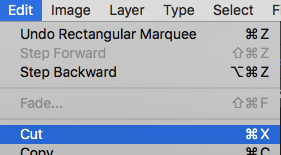 You may select a layer by clicking on its name. 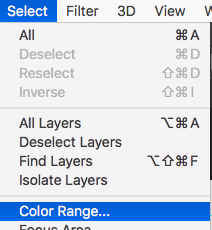 Make sure you have the top layer selected, then use the “Select” menu to choose the “Color Range” option. Set Fuzziness to 50, then select the Eyedropper. 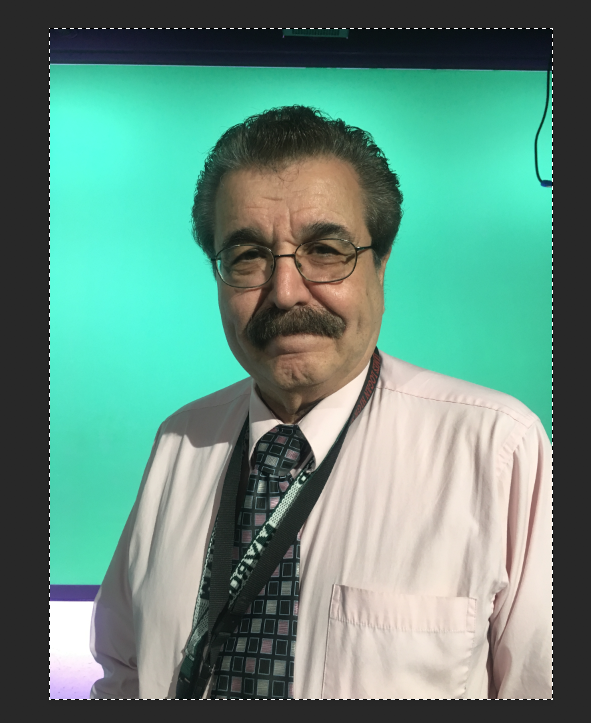 Click on the green background of your image. This will select that color and all similar colors in your image. 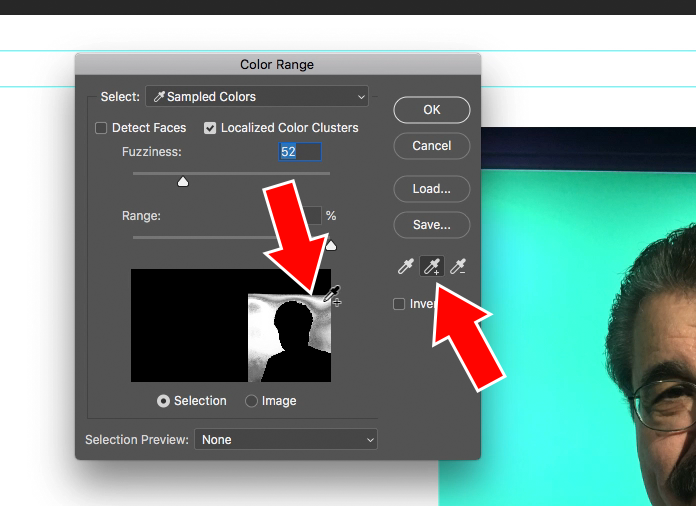 In the “Color Range” window, the white parts of the image silhouette show the select area. Click on the Eyedropper-Plus tool, then click on another part of the green background of your image. The white selected area should grow. You may also click in the image silhouette to increase the selection. Just make sure not to click on the image itself, only the background areas. When you are done selecting you should have solid white surround your image silhouette. Click the [OK] button. Your image will now have “marching ants” indicating the selected area. 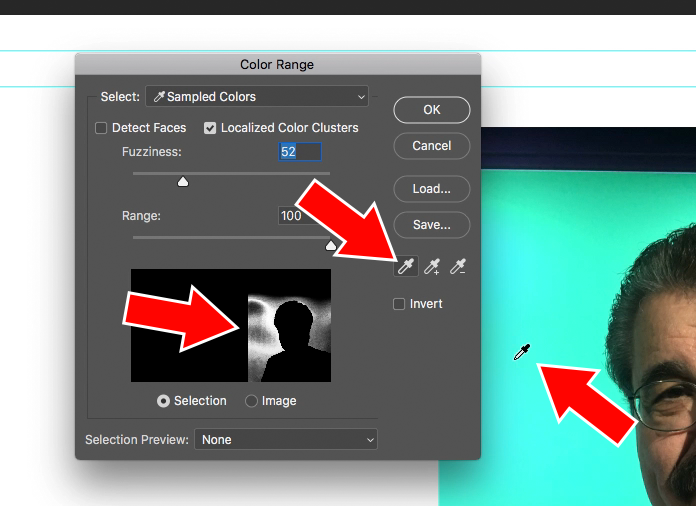 Use the “Select” menu “Inverse” option to invert the selection. Return to the “Select” menu and choose the “Select and Mask” option. The properties window will open. You will need to set the View, Output To, and Show Edge options. Set the “View Mode/View” to Overlay. 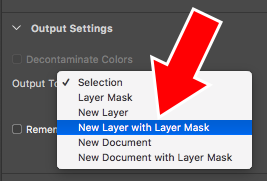 Set the “Output Settings/Output to” to the “New Layer with Layer Mask” option. 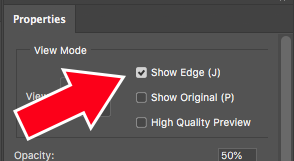 Make sure there is a checkmark next to the “Show Edge” option. You may want to zoom in closer to your image. Use the “View” menu zoom options to zoom in or out, or fit the entire image. You may also use keyboard shortcuts. While you are using the the “Select and Mask” option, you have a choice of brushes on the left-hand side of your desktop. 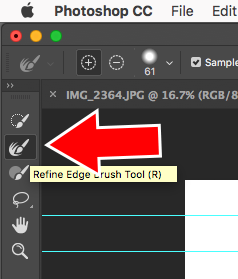 Choose the “Refine Edge Brush Tool” option. 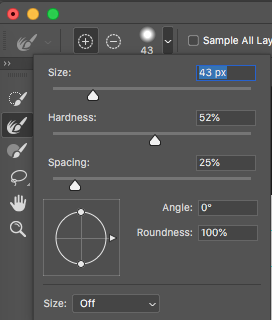 Most Photoshop tools have setting that you may adjust. Click on the brush shape to change the Size and the Hardness. Make the size at least 50, and set the hardness to 50%. 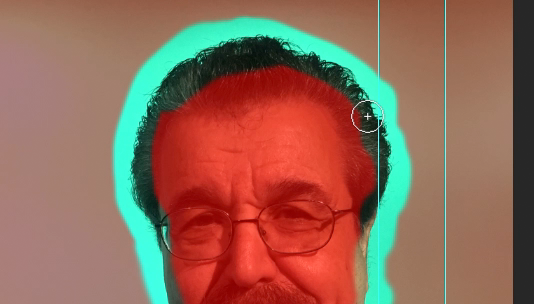 Your image should have a small greenish outline. 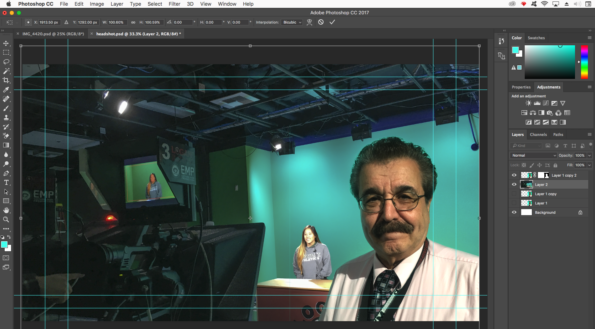 Use your cursor to click and drag around the outline of your image. You will see the green area increase. When you are done , click the [OK] button in the “Properties” panel. Look at the “Layers” panel. 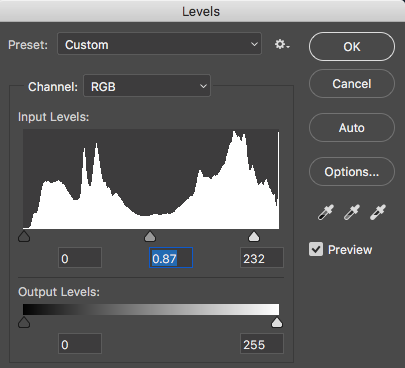 Your top layer should include a layer mask. The eyeball will be on, meaning the layer is visible. The other image layers will have their visibility turned off. The white background will still be visible. You now have removed most of the background from your image. 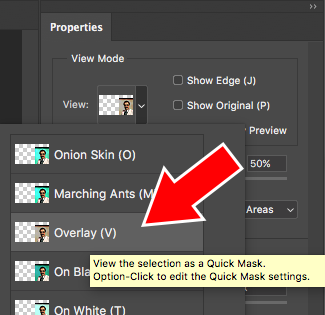 To remove other items, make sure the new, top layer with the layer mask is selected. 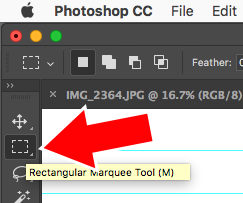 Choose the “Rectangular Marquee Tool” from the left of the desktop. 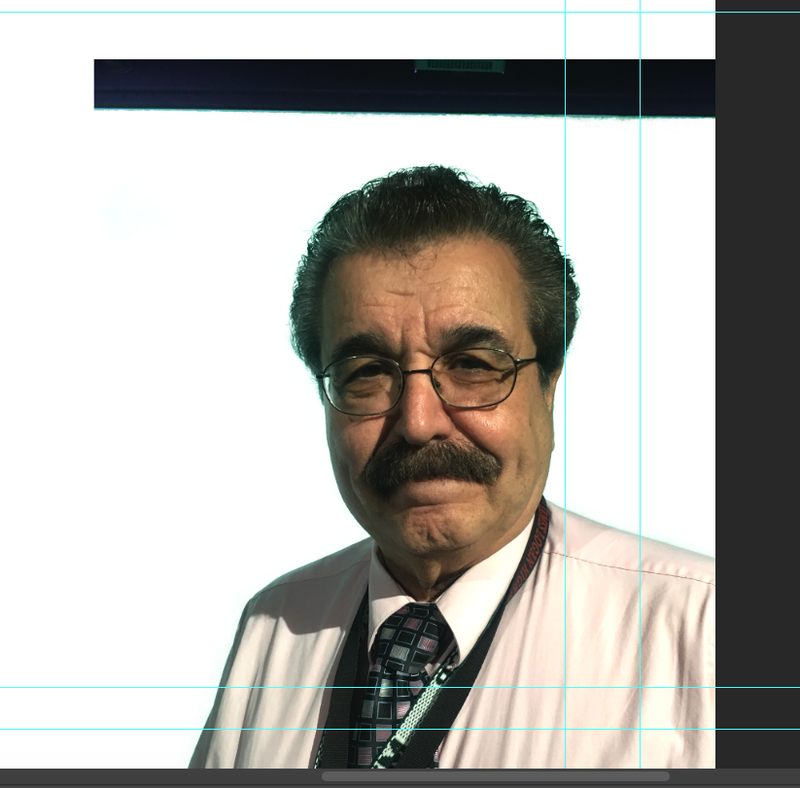 Click and drag a rectangle around the background object you want to eliminate. Once the object is selected, use the “Edit” menu “Cut” option, or the [Command+X] keys to cut the item. Think about an image that should appear in the background that represents you. This image should have a large resolution. 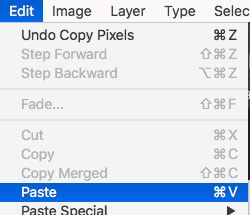 Open the image in Photoshop, then select and copy the entire image. 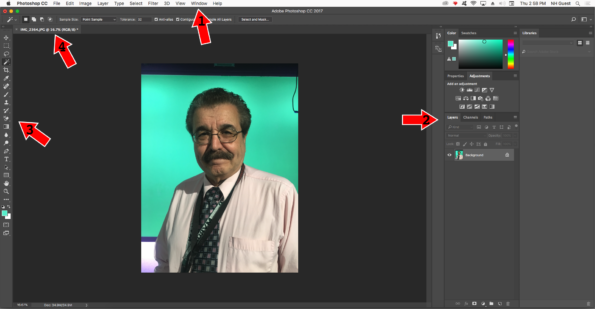 Paste the image onto your headshot.psd image. If your pasted image covers your face, use the layer menu to move the layer down. Use the transform tool to resize and position your background image. When you are satisfied with the result, save your image.